“Greater love has no one than this, that he lay down his life for his friends” (John 15:13). God’s love is free but the Vatican says it has a copyright on the Pope. 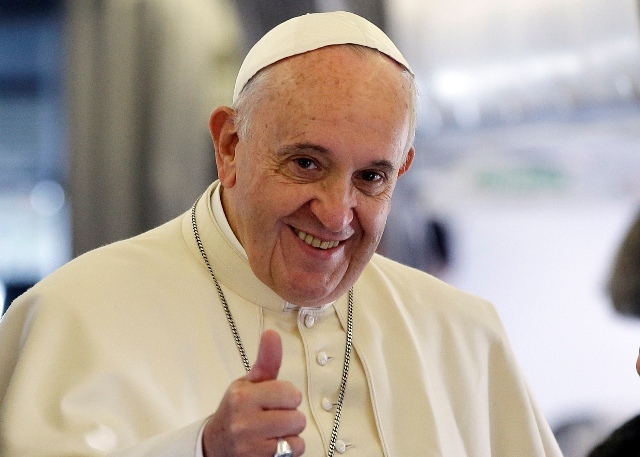 Disheartened by the expansion of the papal-themed T-shirts, snow globes and tea towels around the globe, the Vatican plans to protect the image of Pope Francis and the crossed keys emblem of the Holy See. Interestingly, the Vatican has hired the global law firm, Baker McKenzie to protect its intellectual properties rights ( the Italian daily Corriere della Sera reported without citing the source of the information). Experts say the Vatican officials have grown fearful the faithful will think that the church is making money off the merchandise. The ease with which Pope’s image can be copied in the age of the internet has created a flow of papal knick knack. Pope Francis is the 266th and the current Pope of the Roman Catholic Church. Vatican City, a city-state surrounded by Rome, Italy is the headquarters of the Roman Catholic Church. It is the smallest state in the world both by the population and area.